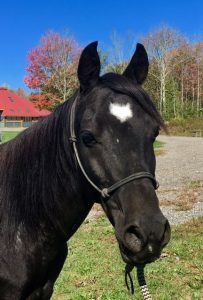 Stanley arrived in September 2017 through collaboration with the Hooved Animal Sanctuary (HAS) of Vermont. Due to neglect, this 14 h Arab had been removed from his previous owner and arrived at HAS in December 2015. At the time, he was a stallion in poor body condition who had very limited handling. After the court case was decided 6 months later, HAS was officially able to assume ownership. Stanley was gelded and his training could finally begin. Due to the good work put in by the crew at HAS, Stanley came to us with excellent ground manners and he ties, trailers, and is good for the vet and farrier. Since coming to Hope, Stanley has mastered our obstacles with ease and spent a lot of time being ponied out on the trails before winter set in. With his slight build, we felt it was important for Stanley to build muscle and conditioning before beginning work under saddle. Currently, Stanley can walk/trot/canter under saddle and has spent a lot of time out on the trails. We've taken him on several off property 'field trips,' and most recently he's begun riding out alone. Although he can be a bit spooky on occasion, Stanley continues to gain in confidence and we have no doubt that he will make someone a fun and versatile partner. This cute little guy is a quick learner and is a bit of a ham with his friendly and personable attitude. Stanley is available for adoption through the Hooved Animal Sanctuary. UPDATE: In June 2018, Stanley was adopted by a wonderful woman who had spent a long time looking for just the right companion to learn with and enjoy. Stan will be staying right here in Maine, and his new mom already has plans of trail rides, beachrides, and learning to jump. We thoroughly enjoyed our time with this spunky little guy, and we can't wait to follow his progress. Happy trails to Stanley and Layne!